Hmmm … Is it, isn’t it? Isn’t it usually ready in 5 minutes, but this says tomorrow, that is, until next year?! Oh, wait … It must be a midnight tea! I’d rather have my nostrils assailed fragrantly than a tooth cheek flow! 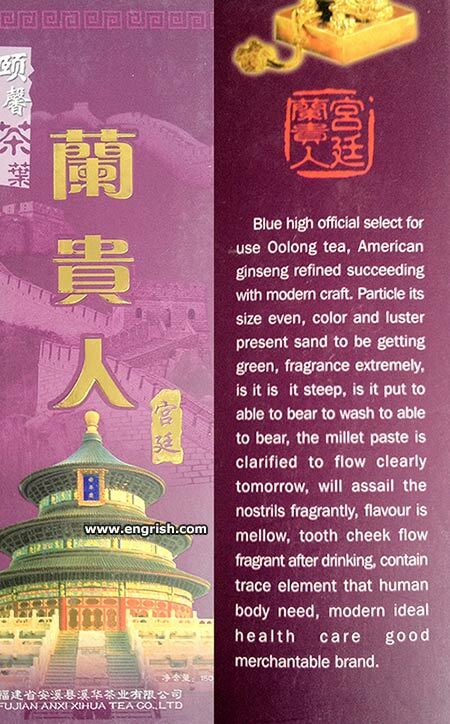 I thought American ginseng refined succeeding with a modern name, perhaps SooLong tea? Two out of three bears prefer it. My modern craft is full of ools. That’s odd. Oolong tea doesn’t usually repeat on me. If you catch her by surprise, that is what an Asian Lady usually squeals:”IT’S OOLONG! IT,S OOLONG! the Gold Coast could become the Verdi Coast. It also adds luster to your cluster. In the movie “Road To Hong Kong”, Bing Crosby keeps trying to get Bob Hope to “sip a little Oolong tea”. Of course it has an “extra” ingredient in it. It is able to bear, but only while it’s bruin. These words are divine revelations through monks at the Temple of Heaven. It’s hard to decipher because it’s divine and needs translation from Shaolin monks. There is a firm which makes Green Tea Ice-cream. It is an off white grey-ey green colour, and tastes of very little at all. I cannot trace the elephants that human body need. Tea tastes better out of china. Tea tastes better out of Japan and Korea. If your Asian lady cries: “It’s oolong!” Assure her that it’s a normal Australian Pekoe.